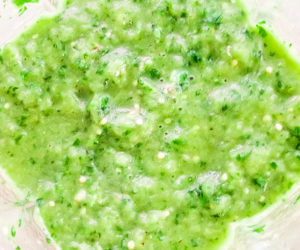 The best Mexican salsa recipe is salsa verde! 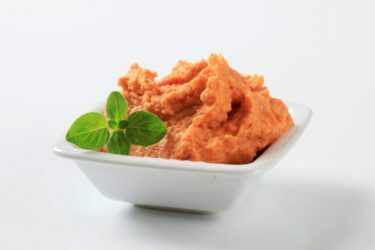 It's perfect as a dip, on top of steak, chicken, pork, tacos, burritos, tostadas, empanadas and even eggs! An absolutely awesome and hyper-delicious salsa. 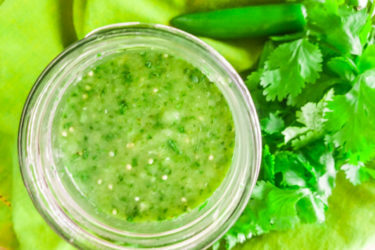 The Best Mexican Salsa Recipe that has ever existed is the authentic tomatillo salsa, tomatillo serrano salsa, salsa verde or green sauce! 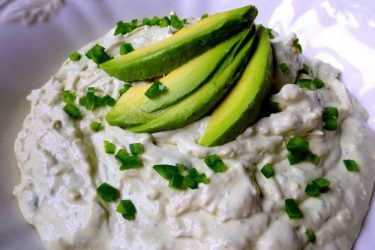 In my opinion it is absolutely one of the best sauces and/or dips that Mexican cuisine has to offer us. It’s so versatile! It works in absolutely almost everything, every dish, every meal. Don’t believe me?! Don’t worry, I will make you a believer before you finish reading this post. 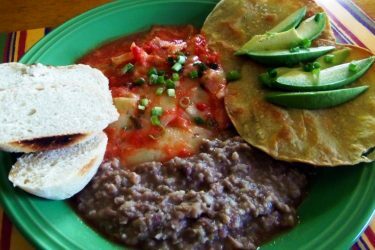 I have plenty of recipes on my blog, Mexican Appetizers and More to prove it, and plenty more recipes to come using the best Mexican Salsa recipe ever! Yes, that’s it! Well, maybe some salt to taste but it's not necessary, especially if you are watching your sodium levels annnd maybe a little of water or chicken broth if you want a saucier texture, but again not necessary! SO, WHAT IS A TOMATILLO? Quickly, let’s talk about what a tomatillo is exactly. A tomatillo resembles a green tomato except that it has a husk that covers it and must be removed before using. It is native to Central America and Mexico and is highly used in a variety of dishes. 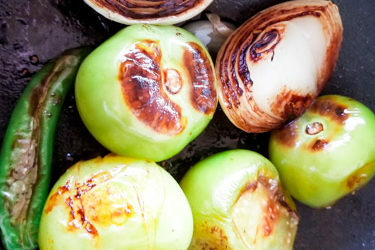 Tomatillos are used raw as well as cooked. First start by roasting the tomatillos, onions, serrano peppers and garlic. Place them all in a blender or food chopper. This is what the Best Mexican Salsa recipe will look like when blended. Note: If you cannot find fresh tomatillos in your produce section, you may use canned tomatillos found in the international or ethnic aisle of your local supermarket. You will not need to roast these. 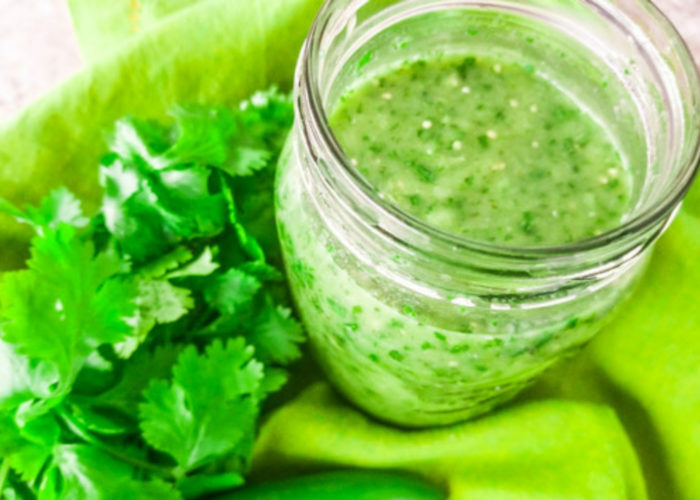 It will not yield the same exact flavor but nonetheless you will be able to make salsa verde and the best Mexican salsa recipe. In a pan over medium heat, add 1 tablespoon of oil with tomatillos, onion, and peppers. Roast until charred, turning over as one side is done roasting. Add garlic and roast for a minute or two more. Note: It is not necessary to roast all except tomatillos but sometimes when I make this sauce I will roast all together. Also remember to rinse tomatillos well as when you remove husk the tomatillo skin is sticky. 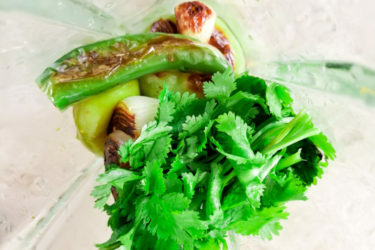 After all the ingredients have been roasted, remove the stems from the peppers and place all ingredients with the cilantro in a blender. Blend until desired consistency. I like mine a little chunky, but if you would prefer it saucier just add a tablespoon of water (or chicken broth) at a time until the preferred consistency is reached.